It’s a bit of a tradition to do some sort of review of the year. This year I’m combining this with my love of the data visualisation site Wordle. Wordle takes blocks of text and displays them in a manner that allows you to instantly see which words are used more frequently that others. The more often a word is mentioned the bigger the word is displayed. I’m hoping this makes sense! For the review of 2010, I’ve taken the titles of all the documents manually uploaded to TRIP during the year and given it to Wordle to display, the results are below. The graph should expand when it’s clicked, but if not the full word cloud can be viewed here. RIS is the file format for reference management software and we’ve been asked on a number of occasions if TRIP can support this format. 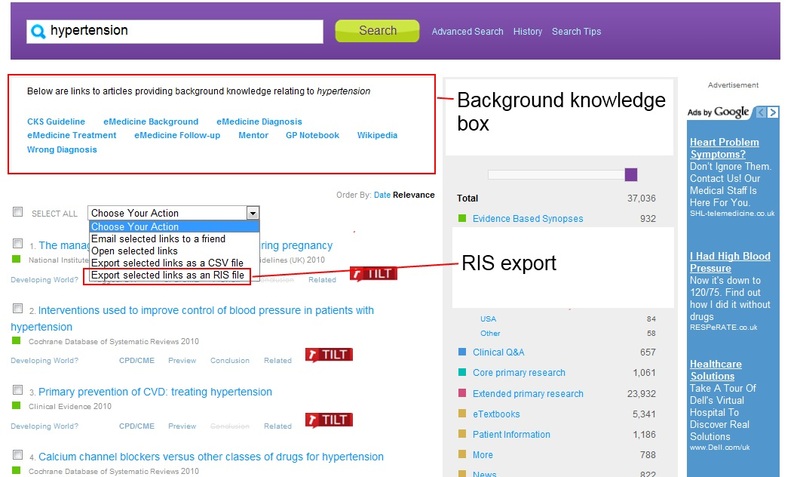 In other words, allow users to select search results in TRIP and export them – via RIS – into their reference management software package. We’re delighted to say this has now been released and users can select it via the drop-down menu at the top of the search results (see image below – click to make bigger). NOTE: TRIP does not have access to all meta-data so the export will be for partial results only. Another bit of work we’ve been doing is looking to 2011 (see previous post). I’m very keen to redesign the results page to make the results more useful. One feature that we’ve spent a lot of time creating has been the background knowledge boxes (these appear at the top of many of the search results that link to eTextbooks linked to the search terms – see image above). However, we’ve started to look at how popular this feature is and yesterday it was used 30 times. This seems relatively little, so perhaps we need to consider if such a modestly useful feature deserves such prominence. It’s always the battle, balancing the demands on precious screen space between results and ‘added value’ features. I’m guessing, if you’re reading this that you like TRIP and feel what we do is important. If that is correct can you please read our request for donations.